Australian made polyurethane hose with fittings, makes an ideal 7.5 metre wash down hose kit. ​The mirror smooth interior surface of Esdans Self Store hose gives optimum air flow at the full nominal diameter and hence air tools operate more efficiently. Lubrication oil added by means of ‘airline oilers’ reaches the working parts of air tools to keep the working parts running smoothly. Self store hose is made form nylon and does not contaminate the oil or give off any sticky residue to damge air tool as found with many rubber hoses. 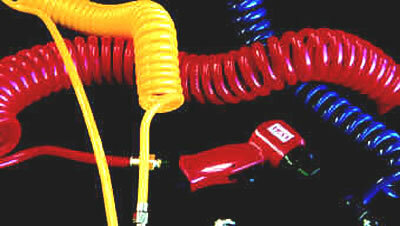 ​Esdan Plastics Suzi coil Air Brake System Tubing is manufactured from Nylon. These products are designed specifically for the transfer of air between the prime mover and semi-trailer, although other applications such as truck, trailer combinations are often used. Esdan Suzi coils are all SAE J844, helically coiled to give the desired working length, and retractable to a very short length to store out of the way when not in use. Long tail Suzi coils have a 1 metre tail for applications where the air connections are elevated 1m above the chassis. ​DURABILITY: When the going gets tough, POLYCOIL is the easy choice. ABRASION RESISTANCE: On concrete floors, even outside on gravel driveways, POLYCOIL hose can outlast normal hose by up to seven to one. EXCELLENT MEMORY: Stretch it to its limit, run over it with a car, POLYCOIL hose bounces right back. GOOD RESISTANCE TO FUELS: Fuels and oil such as hydraulic oil, olive oil, transformer oil, petroleum and kerosene don't worry it. WIDER OPERATING TEMPERATURES: From minus 30oC to plus 90oC. POLYCOIL hoses can be used in cool rooms, the snow fields, on hot concrete driveways and other places where wide temperature variations are encountered. SUPERIOR RESILIENCE: Working length is 80%of the actual length. FLEXIBILITY: POLYCOIL hose resists vibration fatigue and premature aging. CONVENIENCE: Available assembled with threaded ends and spring guards for instant fitting to your air tools. Can also be supplied without ends. MANY OTHER BENEFITS: A small coil diameter and lighter weight reduces operator fatigue. Straight tails on the ends makes it easier to use with air tools. Straight tails allows joining of two POLYCOILS.